This week’s Foodie Underground column on EcoSalon, all about the simplicity of good food. I had walked by the socca stand once before. 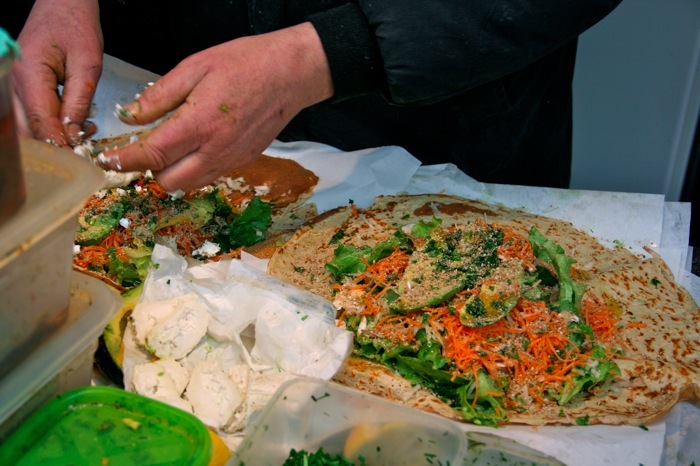 All the way in the back of Paris’ popular Marché des Enfants Rouge, full of various food stands and markets, there was a gray-haired man making the traditional street food from Nice, “socca” scribbled in white on a black chalkboard. 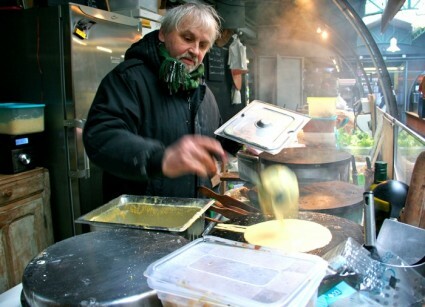 A crepe made of garbanzo bean flour; it’s a specialty that’s hard to find out of the region. Tracking down garbanzo bean flour a couple of years ago at an ethnic food market, my mother started making them. They became an instant family classic. In the middle of a very cold day at the height of rush hour, we opted for a pot of Moroccan tea instead, but I made a mental note to come back. A couple of weeks later, we were in the neighborhood just at the end of lunch hour. The market had mostly cleared out after the midday rush, and the line at the socca stand was only a few people long. Beyond socca, the specialty was obviously galettes – large crepes filled with whatever you wanted – and grilled sandwiches. 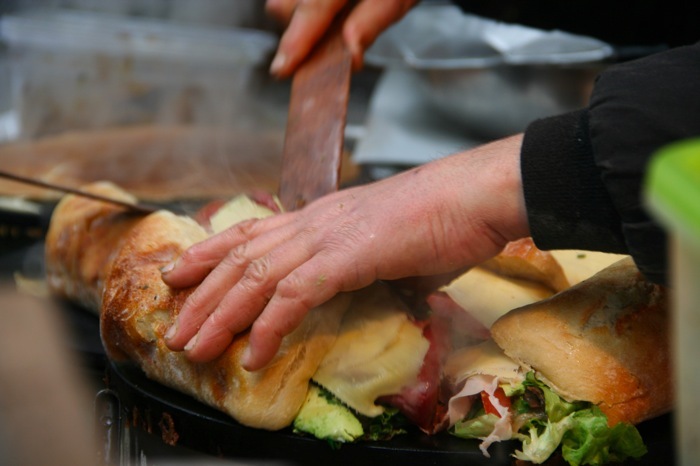 The gray-haired man working the stand filled ciabatta with a variety of ingredients and put them on his expansive crepe griddles. “Alors, vous voulez quoi?” What would you like? Two galettes stuffed with a handful of vegetables and a socca for good measure. The man, whose name was Alain, went to work. Throwing a pre-made galette on the grill and filling it with grated carrot and fennel, mushrooms, lettuce and a roasted eggplant spread. He opened up a Tupperware filled with goat cheese and threw on more than a few rounds, his fingers covered in bits of cheese. He moved in a meticulous yet artful way; a frantic type of methodical in the way that only someone that has been doing something for many years can do. He looked up, “et le miel!” he said emphatically, as he brought out a jar of honey and held it high up as he drizzled it over the entire thing. He wrapped the cornets in paper and handed them off. “Tout bio vous savez!” All organic. Meanwhile the socca had been cooking on the crepe griddle at the edge of the stand. I asked him if it was easy to get socca in Paris. “Non, je suis le seul à le faire.” I have yet to verify whether or not he’s actually the only one in town making socca, but I took his word for it. He sprinkled the garbanzo flour crepe with an herbed salt, broke it into small pieces and threw it into a white bag. It was so warm it was steaming. Comfort street food. The cornets were huge, more food for 6.50€ than you could probably get anywhere else in Paris, unless you were stuffing yourself on a baguette and a jar of Nutella. This city, like many other food metropolises, is full of five star restaurants and world-renowned chefs, but it’s moments like these that are a reminder that often, the simplest ones are the best. I asked Alain what the name of his food stand was. “Il n’y en a pas.” There isn’t one. Of course there wasn’t. This was a man cooking food simply for the love of food. We like to over complicate things with multiple course dinners and fancy drinks. Those all have their place, but in an complex world, simplicity is more and more sought after, be it at a food stand in a market or in the kitchen. Compare a cookie recipe from the early 1900s to a more modern one. The former will be a single mixture of butter, eggs, sugar, flour and baking powder. Simple ratios. There may not even be a temperature or time indicated. The home cooks of the day were merely supposed to have the knowledge to take care of that on their own and know when the cookies were done. Take that same recipe from a modern book and it will fill up a page, you will be instructed exactly how to beat your eggs and cream your sugar and you’ll probably even get a complex icing concoction. Not to mention the images that show the cookies sitting on a romantic farm table, lightly dusted with the flour from the baking process and a cozy cup of tea in the corner. It might provide for inspiration, or it might just be a reminder that you’ll never accomplish the same thing. We have made food for millennia, crafting and concocting and figuring out how to put ingredients together and create something new. From the more caveman methods of roasting a freshly caught animal over a fire, to modern day boiling, whisking, broiling and frying, we have evolved into a species that doesn’t just forage for fruits and berries: we do something with them. Culinary evolution has followed that of mankind, bringing us to the current day and age of the food cart, the five star restaurant and the cookbook shelf with thousands of new titles. And yet somewhere along the way we reached a moment where we stopped cooking. Where convenience and prepared food became such the norm, that we didn’t have to know what to do with ingredients. Someone else could do it for us. These days, we don’t know basic ratios. We have never roasted a turkey. Stocking a pantry is beyond us. Eating has nothing to do with the effort of our brains or hands, all we have to do is order, and so in this complex process of culinary evolution, we ourselves have actually devolved, unable to put simple ingredients together and make a meal out of it. There’s no simple answer to this dilemma. It involves better food education in schools. It requires better access to food for everyone, not just those that live in food capitals. It involves a serious investment in revamping the entire food system. But it does also require a personal re-commitment to simplicity. A re-commitment to buying carrots from the farmers market and washing the dirt off ourselves, to working with the ingredients we have instead of ordering take out, to appreciating good food for good food’s sake, not because a magazine or guidebook said we should care about it. That’s what people like Alain stand for. The love of food for food’s sake. Food doesn’t have to be complicated. It just has to be good and made with a little bit of passion. There’s beauty in simplicity after all. Socca is super hard to find in Paris- my husband spent his childhood holidays every year in Beausoleil- near Nice- and we always have socca when we go there. Alain is the only person I’ve seen making it in Paris and we don’t go there enough to enjoy it. I”m inspired to make a trip now!